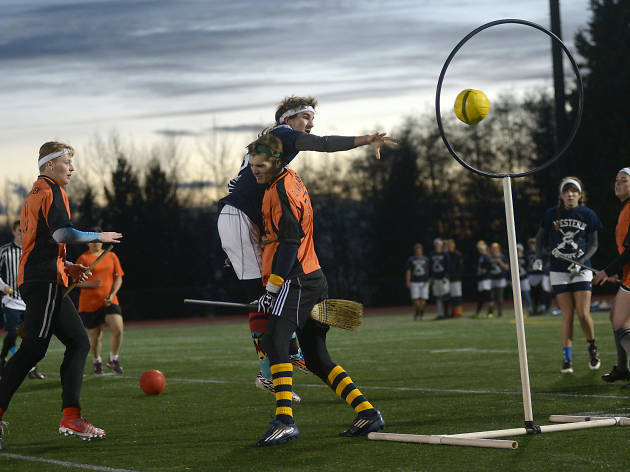 With Harry Potter and the Cursed Child opening on Broadway this week, we decided to talk to Mary Kimball, the league’s national events director, who answered some questions we had about the bewitching, Potter-inspired sport. 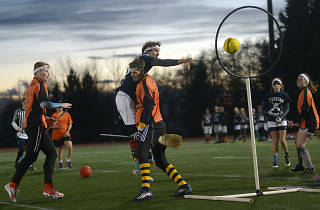 So, what is non-magical Quidditch? It’s a full-contact, mixed-gender sport that has elements of rugby, dodgeball, capture the flag and flag football. It’s basically like rugby with a stick between your legs. We don’t fly, obviously. Every player has to be on their broom at all times, and the other details are like the novels: You can be either a Chaser, Keeper, Beater or Seeker. We don’t swat a Bludger with bats—you just throw dodgeballs. The Snitch is more like the flag in capture the flag: We have a neutral athlete, dressed in all yellow with a tail, and the goal of the Seekers is to pull the tail off the Snitch. If that happens, the game is over. Each Quaffle goal is worth 10 points, and if you catch the Snitch, you get 30 points. Do you feel silly while playing? I find that I’m concentrating so much on not dropping the broom between my legs that I don’t feel silly at all. If you do drop the broom, you have to go tag your team’s hoops to be eligible to play again, so you’re really focused on keeping it there. 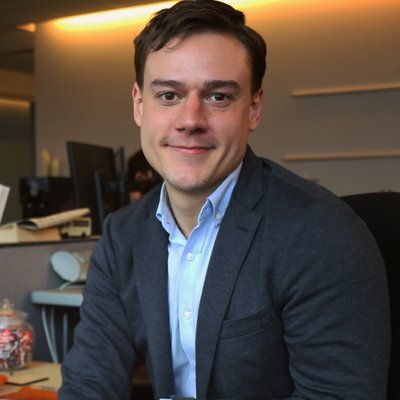 How can I get involved with Quidditch in New York? There's a major league team in New York called the New York Titans that you could become involved with. There are also a number of teams that practice in the city and compete in fantasy tournaments. There's usually only a small entrance fee to participate in those, around $10. But where can I get a broom? The brooms are made out of PVC plastic. They’re half-inch PVC pipes. We also have custom-made brooms made out of a Quidditch equipment supplier in Austin called Petersons Brooms. There are also people in New York and Seattle that make bases and brooms. They're not that hard to find, actually!